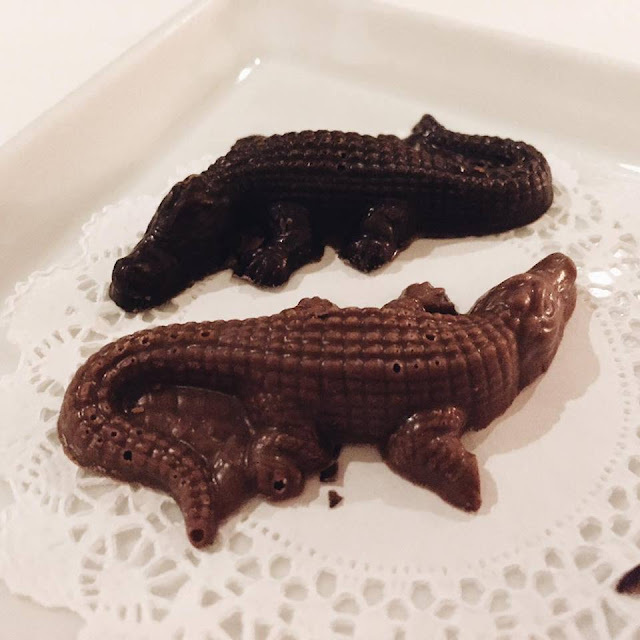 For Valentine’s this year, S spoiled me with a fancy five course dinner at Le Crocodile. 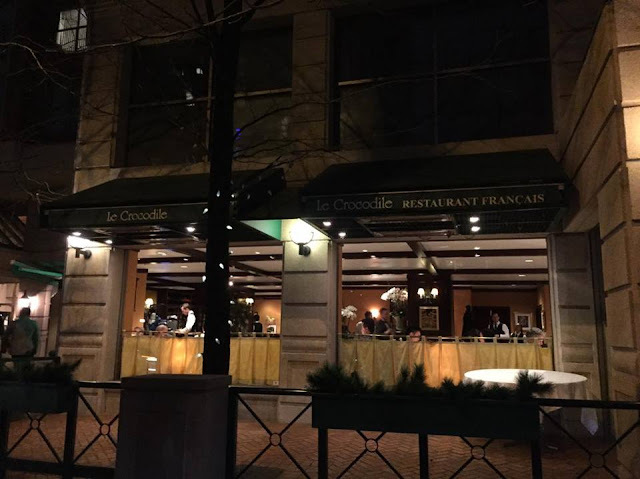 Le Crocodile has been around for over 30 years now and is known to Vancouverites for being the classic fine dining spot featuring French cuisine. This elegant restaurant is known to impress. Surprisingly, the restaurant was quite brightly lit, although they did dim the lights later in the evening. Many couples had already been seated when we arrived. I don’t know if the seating is as tight on normal nights, but I found that we were quite close to the other couples next to us, so it wasn’t the most intimate experience. Perhaps they tried to fit more people in during this night to maximize capacity. 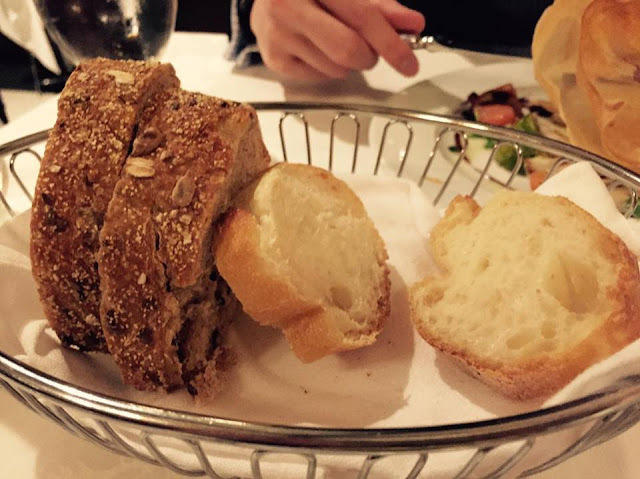 Dinner started off with complimentary bread, which featured both white and whole wheat. Slightly warm but not the best I’ve had. I found it on the harder side. Our first appetizer on the menu was the Dungeness Crab Cake Lady Purse which was served with a heirloom tomato and fennel salad with lemon and yam aioli. The presentation was beautiful with the puff pastry shaped into a beautiful fan. However, it got quite messy as the pastry got everywhere on the table when we began to eat it. The crab cake itself was pretty good and I really enjoyed the salad which has a nice acidity to it. 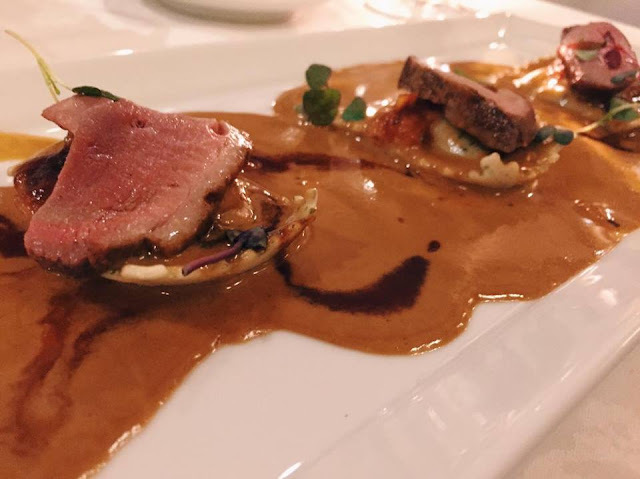 Next up was the Wild Mushroom Ravioli served with thinly sliced duck breast in a foie gras veloute. The duck was nicely cooked to a medium rare and I loved the earthy flavour of the mushroom filling paired with the foie gras sauce. However, I did find that the ravioli was slightly undercooked for mine. The edges were still quite hard. Not sure if they did that on purpose. 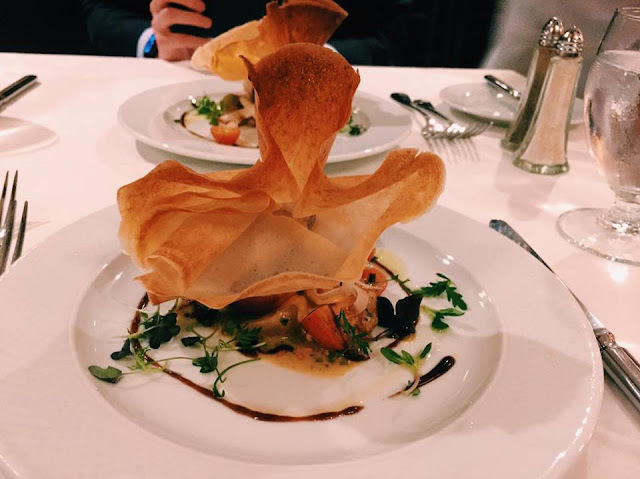 For our mains, we could choose between the Grilled Beef Tenderloin and Roasted Lobster Tail or Sablefish with Tagliatelle Pasta and Grilled Alaskan Scallops. 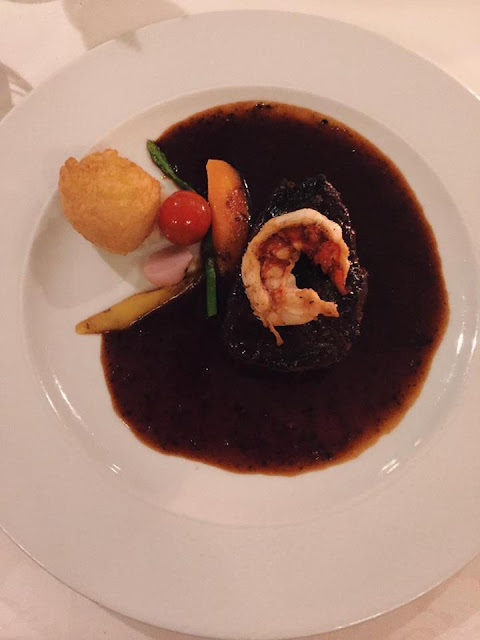 However, S and I both ended up choosing the Grilled Beef Tenderloin and Roasted Lobster Tail. This was served with a pinot noir and black truffle reduction. The tenderloin itself was quite a large portion and I liked the crispy edges. However, I had asked mine for medium rare and I found it to be slightly more of a medium. Only the very centre was more rare. S’s was cooked on point though. The lobster was slightly too salty for my liking. However, I really loved the red wine and black truffle reduction. I couldn’t stop dipping my meat into it! 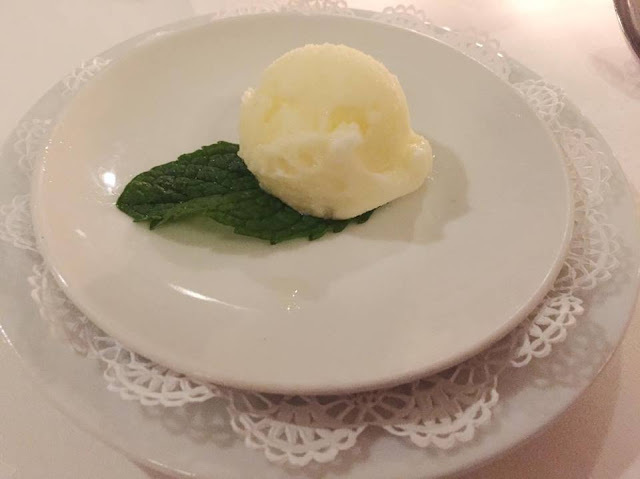 We were then served a palette cleanser which was the Pineapple and Vodka Sorbet. It was really refreshing and definitely cleaned our palettes from all the previous flavours. Lastly, for dessert, you get to share their Valentine’s Dessert Creation. This was perfect since we were already really full! 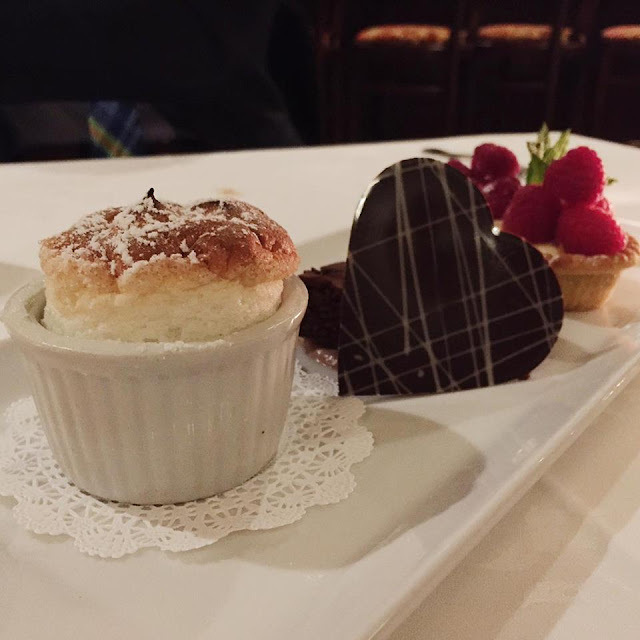 It came with a delicious coconut soufflé. This was super light and fluffy! My favourite of the three. In the middle was a chocolate brownie with maple caramel ice cream. On the very end were two lemon curd tarts topped with raspberries. I found these a little too tart for my liking. 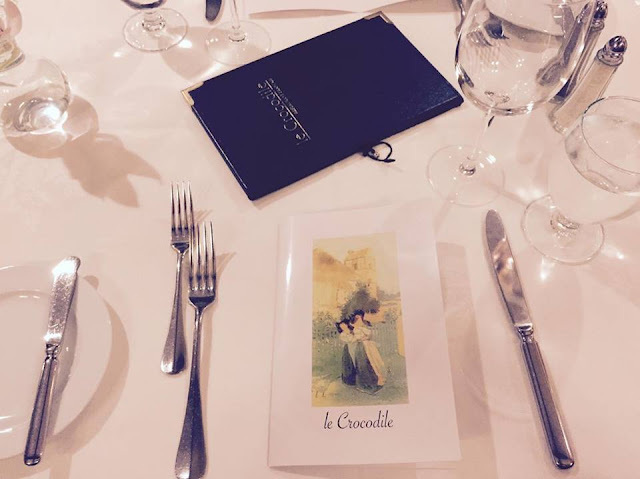 Overall, we enjoyed our evening at Le Crocodile with a great fine ding experience and service. However, I had higher hopes for the food and left feeling everything was good but nothing “wowed” me. You know that feeling when you want to go back already and have the dish again? That didn’t happen based on the dishes on the Valentines’ menu… I guess they settled for dishes that could be easily executed during the busy night, so I think I will have to come back again on a regular day to get the full experience and choose dishes they are famous for. Plus for $98 a person, this was quite a hefty dinner.